The Atlanta Hawks 3vs3 Tournament and Sharecare Heartbeat Festival will be postponed to a TBD date this fall due to inclement weather conditions. Fill out the form below to receive information on the rescheduled date! 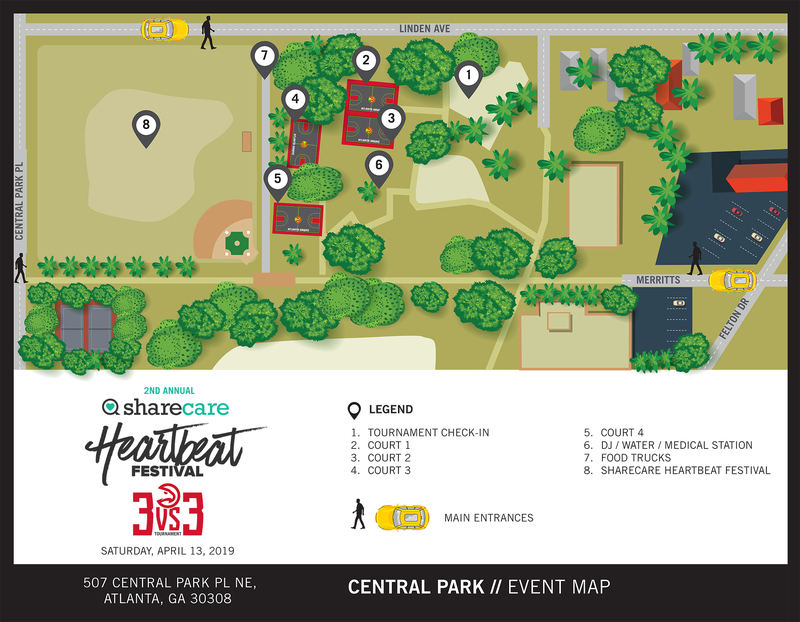 The Atlanta Hawks Basketball Club, Sharecare and the City of Atlanta Parks & Recreation are teaming up for the 2nd Annual Sharecare Heartbeat Festival at Central Park on Saturday, April 13. The festival is a free, family-friendly event to celebrate and rally Atlantans around the #SharecareMovement for the health and well-being of their communities. MARTA and Rideshare are highly encouraged, however, there will be parking available at the Grady Health Ponce De Leon Center located at 340 North AV NE, Atlanta, GA 30308. Limited street parking will also be available. In the event of inclement weather and unsafe playing surface conditions, the basketball tournament and festival will be postponed to a TBD date this Fall to protect the health and welfare of the athletes and community members. Tournament participants will be emailed a notification of cancellation prior to competition. We will monitor the conditions closely and update this page and Hawks social channels accordingly.